Forgive Yourself and Everyone Else in Your Life in About 2-1/2 Hours Without Having to Tell Your Story! Learn about Radical Forgiveness, how it differs from conventional forgiveness and experience it directly for yourself. You will leave feeling a great deal lighter, free from old emotional pain, and a lot more peaceful. And the effects are permanent. 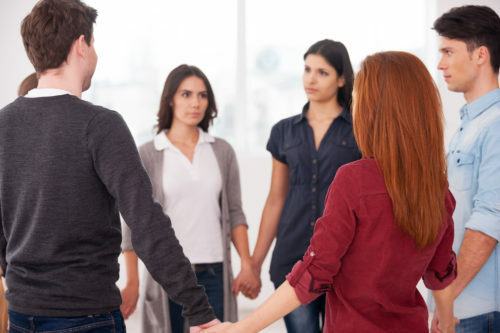 Based on the idea derived from many indigenous cultures that when we form a circle, we create a sacred space in which healing becomes possible, this largely non-verbal process preserves privacy and anonymity, yet has proven itself to be extremely powerful and effective in allowing people to forgive themselves and others, and to find peace and happiness. We walk the circle once to silently honour and witness our ‘story’ of what happened. As we see others walk too, we realize we are not alone and we honour their pain. After hearing a special Radical Forgiveness story, we walk the circle again and ask inwardly to come to a new place of forgiveness and peace. Believe me, it works! People leave with tears of joy and smiling faces. Please come! It is entirely non-threatening and yet is quite likely to change your life forever! Does your community need a Circle Ceremony? Because we are all connected by energy this powerful ceremony can greatly benefit a group of people who are connected together to have more peace, harmony, grace and ease. Great for families, workplaces, teams and groups who want to have more loving, compassionate and collaborative relationships. Contact us to learn more. Must be 18 yrs of age or older to participate. There are no upcoming ceremonies at this time, please visit my Facebook page for all current events.